NOTE: Adapter not included in the package. The bath brush will automatically stop after five minutes of work, then you need to restart. It is the protection measures of bath brush. 1. With soft silicon gel, extensive brush head, long brush pillars, and thus making lots of foams. 2. Designed with lengthened handle, not only using for whole body, also cleaning the part which can not be cleaned by traditional tools. 3. With IPX7 level of water-proof, using while taking shower or in bathtub. 5. Easily to be cleaned, easily to dry of the brush. 6. With vibration massage for you enjoying comfortable massage while taking bath. 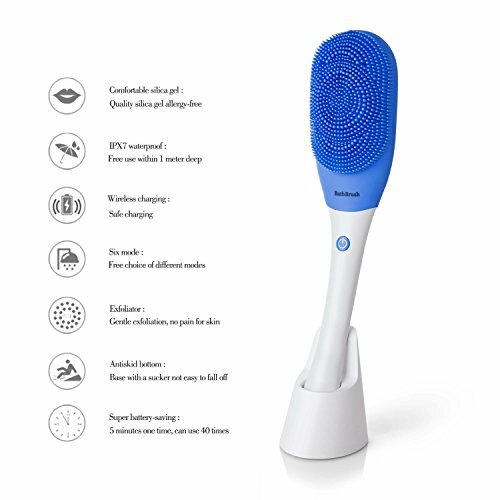 MASSAGE BATH BRUSH: With three level of vibration as high-middle-low, quickly shock with soft silicon gel make lots of foams, suitable for everyone. WIRELESS CHARGING DESIGN: Wireless charging design, the whole is wrapped by soft silicone,IPX7 level of water-proof prevent electric shock, just plug into the socket when charging, more safe and convenient, you can use in the bathtub or shower, also cleaning the part which can't be cleaned by traditional tools. LENGTHENED HANDLELONG HANDLE DESIGN: lengthened handle makes bath brush easy to massage into areas that your arm cannot reach. BODY EXFOLIATING BRUSH: Vibration massage made you enjoying comfortable massage while taking bath, also effect exfoliating. Silicone material brush head, hardness is just right, can both clean your skin and avoid your skin injuries, with a vibration effect, massage your body, remove fatigue for your day. WARRANTY: The warranty period is 12 months after the purchase date. NOTE: The bath brush will automatically stop after five minutes of work, then you need to restart. It is the protection measures of bath brush. If you have any questions about this product by Teaker, contact us by completing and submitting the form below. If you are looking for a specif part number, please include it with your message.